Democrats continue to misrepresent the Supreme Court decision on Hobby Lobby and the Obamacare contraception mandate (which it needs to be stressed is NOT actually written into the law) as part of the never-ending Republican war on women. Leftists are piling on and calling for the deaths of actual women in what is the ignored Democrat war on women. 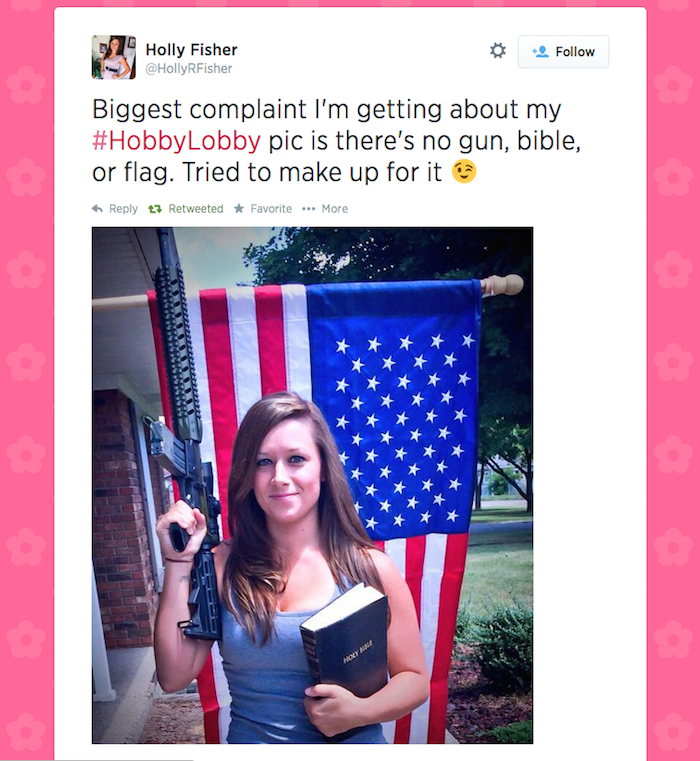 Case #1: Holly Fisher, the wife of a military vet, is a vocal conservative. In the aftermath of the Supreme Court decision to uphold the right of Hobby Lobby and other loosely-held companies to be exempted from the Obamacare contraception mandate (which it needs to be stressed is NOT actually written into the law), Holly decided to post a picture of herself in a pro-life t-shirt holding a Chick-fil-a cup standing outside of a Hobby Lobby. And of course, the Left reacted by cheering her on and chanting, “You go, girl!” I’m just kidding, they made misogynistic comments on social media and called for her death. A few days later (Independence Day), she took it up a notch and posted a pic of her standing in front of an American flag holding a gun in one hand and the Bible in the other. And once again, the Left applauded her right to free speech. Oh wait, I’m mistaken. They accused her of being the American Taliban and created a twitter meme comparing her to the White Widow terrorist Sherafiyah Lewthwaite. Which I find odd, since we all know if Fisher actually was a terrorist the Left would have a lot more respect for her. Case #2: Kendall Jones is a 19-year-old cheerleader at Texas Tech University who is an avid hunter. She has pictures of her hunting expeditions on her Facebook page. Among the pictures are pictures of her posing with dead lions and other animals. Sorry, I made another mistake. It’s actually called “Kill Kendall Jones.” A reporter for the Juneau Empire reported the page for violating community standards because it was “harassment” and a “credible threat of violence.” The response that he got back was that the page does not violate community standards. Got that, folks? A 19-year-old cheerleader posting pictures of her killing animals violates community standards, but a Facebook page calling for said cheerleader to be killed does not. But, it gets better. The “Kill Kendall Jones” Facebook page has the same pictures that Jones was not allowed to post on her own page. Good to know that a dead lion invokes more outrage on the Left than the idea of a dead teenager. POLL: Should #Facebook take down Kendall Jones' photos posing with the wild ANIMALS SHE SLAUGHTERED? So in the past two weeks, we’ve had two women who stood on the courage of their convictions and the party of women’s lib and women’s rights are chanting for their deaths. Thank God Mitt Romney’s not in the White House, or they’d have to pay for their own birth control, which is of no use when a mob of your alleged allies want you dead for disagreeing.